Monday Memos: RawSpiceBar Review…the subscription service that will spice up your holiday season!!! Home | Monday Memos | Monday Memos: RawSpiceBar Review…the subscription service that will spice up your holiday season!!! Hello people of the internet!!! On today’s ‘Monday Memos’ we are going to talk about an AMAZING new product that y’all will be obsessed with this holiday season. Once the holiday season begins we are bombarded with delicious food, but after a while you might feel that you’re growing tired of the same types of food. 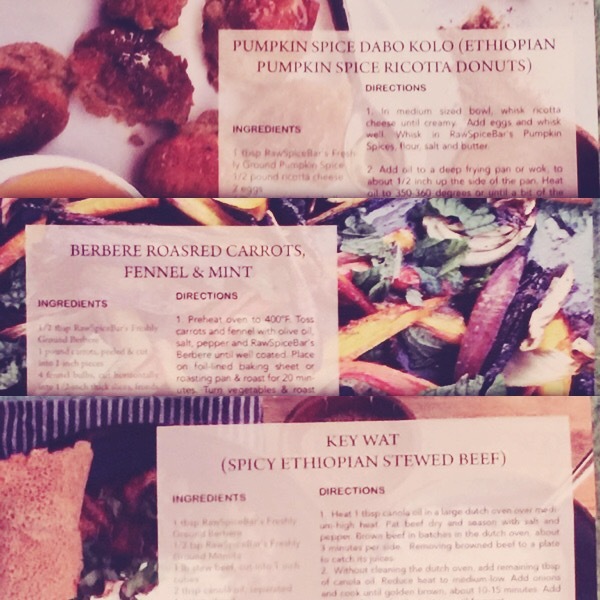 I was recently given the incredible opportunity to review a new spice subscription service called RawSpiceBar. RawSpiceBar is a service that sends you 3 regional species every month, includes recipes of dishes (which feed 4-6 people) that you can use each of the spices in, and tells you a brief history of the region that the spices originate from, all for a mere $6 per month (you can also get a prepaid subscription for 6 months for $36 or 1 year for $66 which means that with this option you get 1 month free, gotta love that!). The spices are all really awesome and the dishes that you can make with them are super delicious. If you love to cook new and exotic dishes, or if you just want to spice up your holiday menu this year then you NEED to subscribe to RawSpiceBar. Now I know that you want to hurry up and subscribe to RawSpiceBar, but if you want to learn even more about these awesome spices then please keep reading! Full disclosure, I did receive these spices from the company to review for free, however this did not affect my opinion of the product itself. Ready? Ok, let’s go!!! The spices that I will be reviewing today were from the features spices for the month of November, and were for Ethiopian dishes. 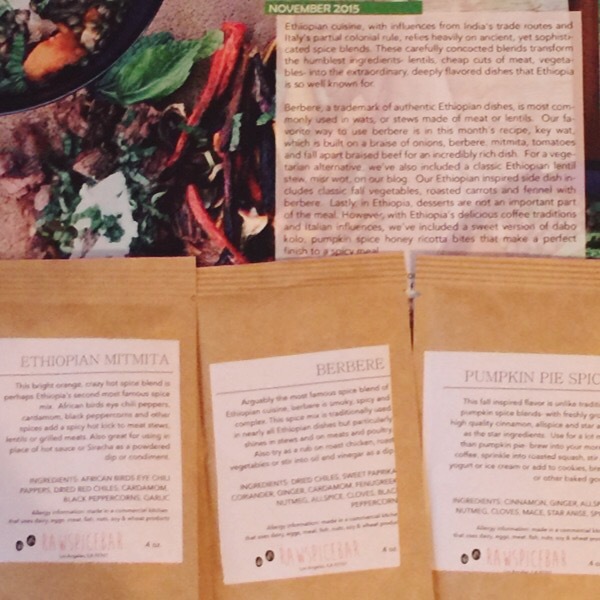 The three spices that I received were Berbere, Ethiopian Mitmita, and Pumpkin Pie Spice. Berbere is spicy and smoky addition that really gives the food a rich flavor. Personally I am a huge fan of spicy food, so this is now one of my favorite spices. You can use this spice with various soups, meats, poultry, as a rub on roast chicken or vegetables, and stirred into oil and vinegar as an awesome new dip, so the possibilities for delicious new dishes with these spice are endless. Don’t worry if you’re not a big fan of spicy food, because Berbere is a little spicy, but not unbearable, and definitely brings out the flavor of the dish in a new and exciting way. Next up we have the Ethiopian Mitmita spice! Now this is a very hot and spicy addition to any dish, that will definitely require you to have a drink nearby. Although this spice is seriously hot, it really makes a great addition to any meat stews, grilled meats, or as a replacement for hot sauce. Like I’ve previously said, the Ethiopian Mitmita spice is really hot, but I would give it a try because you seriously have never had flavor explode onto your taste buds like this before. Lastly we’re going to talk about the Pumpkin Pie Spice. Now I know what you’re thinking how different can this Pumpkin Pie Spice be from every other Pumpkin Pie Spiced food I’m eating/drinking during this time of the year. well trust me when I say that you have NEVER had Pumpkin Pie Spice that was this good! The cinnamon in it will seriously make you feel like baking dozens of cookies, and the blend is sweet but not overly sweet so it’s perfect for coffee, tea, or any baked good you can think of. If you want to kick off the holiday season right, this is the spice to get you in the perfect mood. To wrap everything up, all of these spices were seriously great and I give them all 5 smiley faces (because you know smiley faces are more fun than stars). If the spices for November were so amazing, I can’t wait to see what the next featured spices will be! If you want a unique culinary experience every month than this subscription is a must have for you, and it also makes a great gift for any chefs in the family. I never promote any products that I don’t follow believe in so trust me when I say that $6 a month is a small price to pay for these incredible spices. So subscribe to RawSpiceBar today and get ready to have all the bragging rights at any holiday party this year! All photos and information used in this blog belong Raw Spice Bar, Twitter, Facebook, Instagram, Pinterest, and all other original owners. I do not own anything in this blog. If any people, corporations, businesses, companies, etc, were not previously given credit for their work, they are given credit now and their previous absence was unintentional. All opinions expressed in this blog are my own. I wrote this blog for entertainment purposes and no copyright infringement is intended., and all other original owners. I do not own anything in this blog. If any people, corporations, businesses, companies, etc, were not previously given credit for their work, they are given credit now and their previous absence was unintentional. All opinions expressed in this blog are my own. I wrote this blog for entertainment purposes and no copyright infringement is intended. celindareyesblog December 1, 2015 No Comments on Monday Memos: RawSpiceBar Review…the subscription service that will spice up your holiday season!!!. Category: Monday Memos. Tagged: 2015, 2016, amazing, blog, cuisine, delicious, dish, exotic, facebook, food, hot, incredible, instagram, new, pinterest, pumpkin, Raw Spice Bar, review, spice, spicy, subscription, tasty, twitter, yummy.